A project that has recorded and photographed more than 200,000 paintings in the UK is to widen its scope in a unique project that will produce a public database of millions of works of art. The Public Catalogue Foundation, now renamed Art UK, will eventually include on its website (artuk.org) images and details of 100,000 sculptures and millions of works on paper in public collections. Cataloguing the UK’s oil paintings took ten years, at a cost of £6m. It has resulted in 87 volumes of printed catalogues and a fully-searchable web resource. Of the 213,000 paintings, two thirds are in museums and the rest belong to institutions such as local authorities, universities and hospitals. Ninety per cent of the paintings, owned by 3,000 bodies, had never been photographed and 80% are not on display. Public sculptures, whether in museums or on display in buildings or outdoors, are to be covered in a further project for Art UK. The Heritage Lottery Fund has initially allocated £2.8m towards the £5m cost, and a final decision on the grant is expected early next year. Photographing and cataloguing the sculptures will then take four years. The other element of Art UK will be offering public collections the opportunity to upload their own images and descriptions of their drawings, watercolours, pastels and prints. 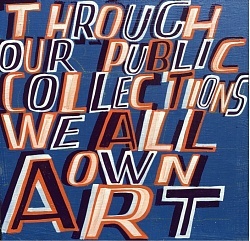 The largest UK public collections with works on paper include the British Museum (375,000 works with digitised images), the Victoria and Albert Museum (nearly 200,000 works) and Tate (50,000 works). Including works that have not yet been digitised would push up the figure for these three museums alone to more than a million. Uploading data on works on paper will begin in July. Art UK will therefore eventually become the definitive database of the country’s publicly-owned collections.